Talk about a complete meal in one bowl! This incredibly delicious Arugula and Smoked Salmon Salad is absolutely packed with healthy fats, proteins and carbohydrates. Not only is mouthwateringly good, but it is very filling and loaded with enough energy and nutrition to last you a long time. I love making this salad for lunch, and I have no problem not getting hungry until dinner time. Or, I will make this salad for dinner when I want to avoid snacking in the evening (which is my biggest problem). 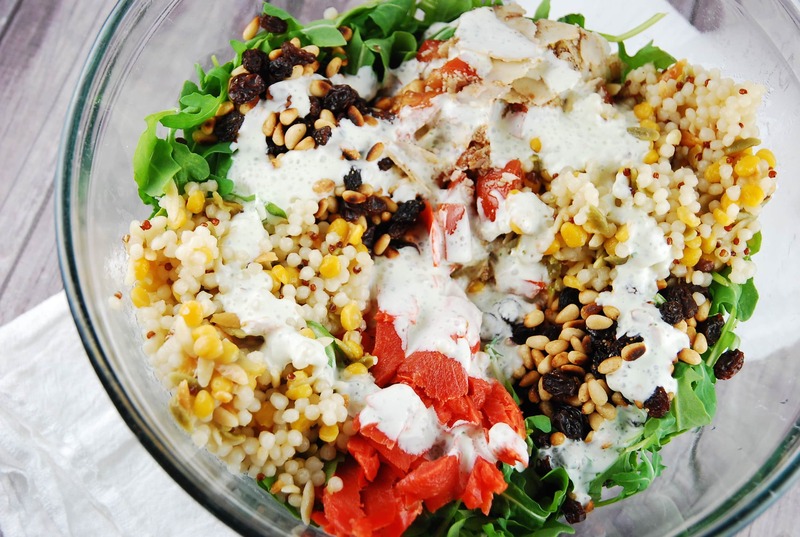 The flavor combination in this Weight Watchers salad recipe is outstanding….peppery arugula topped with smoky salmon, tangy balsamic coated tomatoes, filling whole wheat couscous, and wonderfully nutty toasted pine nuts with sweet raisins. All covered in a creamy, tangy dressing that will leave your tastebuds doing backflips. My husband and I are absolutely in love with this Arugula and Smoked Salmon Salad Recipe, and I highly recommend all of you giving it a try! It’s one very complete, and satisfying dish for just 9 Points. A mind-blowing salad that is brimming with nutrients and flavor, but won’t break the bank. Just 9 Points for one very filling dish that provides enough protein, carbs, and fats to leave your hunger feeling satiated. In a small bowl, mix the tomatoes, oil, balsamic vinegar, parmesan, and salt and pepper. In a large bowl add the arugula and top with the salmon, pine nuts, raisins, tomato mixture, and cooled cous cous. Toss well. To make the dressing, combine the mayo, lemon juice, garlic, basil, and milk using a blender or immersion blender. Drizzle dressing over salad and toss well to coat. Serve immediately. Is that salmon– lox or smoked salmon? Looks like lox. Looks great either way but makes a difference. Love your site. Im your biggest advertiser around here and at my ww meetings.